Are Ovarian Cyst Symptoms making life a Misery? Typical ovarian cyst symptoms for many sufferers is pain and discomfort which can take a number of forms and be experienced in differing areas (see below). But this is not always the case, and ovarian cysts can also be asymptomatic, that is to say they cause no discernible symptoms. As such they may not really become an issue and many women lead lives ignorant of the fact that they even have a cyst, without any problems. You might gain weight without apparent reason. The problem with ovarian cyst symptoms in general is that they are exactly the same as various other problems and could also indicate health issues such as PID (Pelvic Inflammatory Disease), endometriosis, or even an ectopic pregnancy. Seeking your health practitioners opinion is a therefore good idea, but because most general practitioners (GP's/MD's) are not experts in this area, if you are still not satisfied with a diagnosis, do insist on being referred to a gynaecologist who will be able to undertake the full range of necessary tests. If you are already suffering these types of symptoms you should be sure to visit your health adviser as soon as possible for an examination. * Functional cysts: These are the natural cysts that can develop during menstruation around the egg/s. They rupture with ovulation as the egg is released and simply shrink away until the next cycle. * Polycystic ovaries: PolyCystic Ovarian Syndrome, or PCOS can develop where cysts containing eggs do not complete the ovulation process and then grow, leading to pain and discomfort and they can even threaten future fertility. It is important to get an early diagnosis of this potnetial probelm that can be one manifestation of ovarian cyst symptoms. * Dermoid cysts: are cysts that start to develop abnormal and can even manifest hair, teeth and other bodily tissues. These ovarian cysts can grow to an uncomfortable size and cause symptoms including considerable pain. 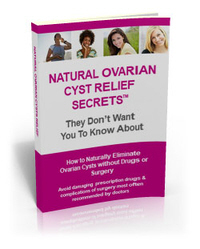 * Cystadenomas: are a type of ovarian cysts that can develop on the surface of the ovary. This can lead to pain and discomfort especially if they reach a larger size. * Endometriomas: these cysts can grow either inside or outside the uterus. They can also grow quite large, causing pressure on internal organs leading to discomfort and pain. These days Ultrasound scans allow effective diagnosis and assessment of an ovarian cyst problem. This is a similar test to the one used when checking a pregnancy. Ovarian cysts may appear as a dark mass or a white mass dependent on the consistency of the cyst. Typically you may be referred for a Ultrasound scan as a result of a doctor's concerns when making a regular gynecological examination, perhaps when taking a periodic smear test, also known as a PAP test. During a gynaecological exam your doctor will normally check for bulkiness around the ovaries and if you also report any of the other symptoms of ovarian cysts (as outlined) this will usually lead to you being referred for an Ultrasound scan. An Ultrasound scan will help identify the shape, size and location of any ovarian cysts. It will also be possible to tell if a cyst is filled with fuild or solid matter, which will be assist in the process of diagnosing the type of ovarian cyst you may have. Additional routine testing usually involves taking a blood sample. Blood tests can reveal unnatural levels of suspicious proteins in blood which could indicate serious conditions such as ovarian cancer. The sooner such a diagnosis is made the sooner you can embark on your preferred method of treatment to provide the greatest chance of effective recovery. This is one good reason for making sure you do not miss your regular smear test. There are various forms of medical treatment that may be offered or prescribed for you if it turns out that you do have one or other form of ovarian cyst. It is important that you react early to experiencing any of the symptoms of ovarian cysts as outlined and see your medical advisor, as recommended. But it is also important to recognize that typical drug-based therapies do not always prove to be as effective for some people as they would like.